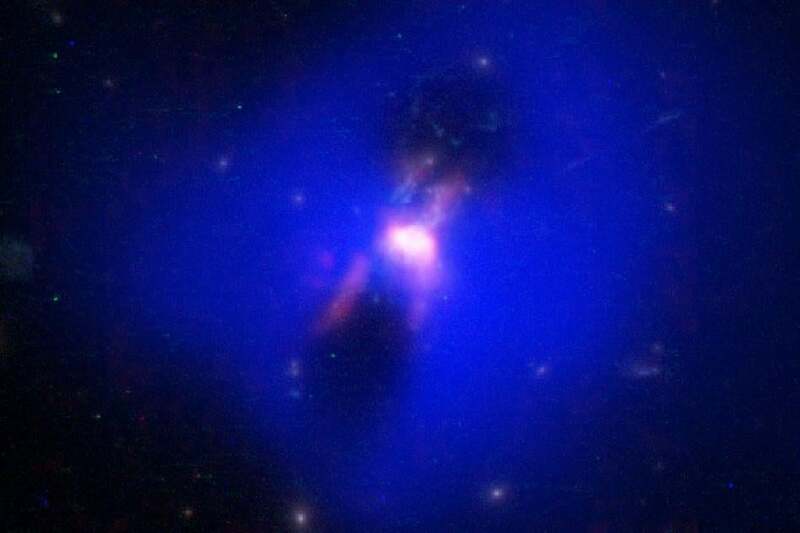 This composite image shows powerful radio jets from the supermassive black hole at the center of a galaxy in the Phoenix Cluster inflating huge "bubbles" in the hot, ionized gas surrounding the galaxy. Scientists believe they have found evidence that black holes feed on passing stars then eject energetic jet streams, according to a study led by a researcher at the Massachusetts Institute of Technology. Dheeraj Pasham, NASA Einstein fellow at MIT, said researchers were able to observe radiation from a supermassive black hole consuming a star, a rare event that was captured by a global network of telescopes in 2014 from 300 million light years away. It was previously known that when a black hole devours a star, it emits X-ray waves , which are produced from hot material from the star as it falls into the black hole. But the researchers picked up on something that scientists hadn’t noticed before — 13 days later, high-energy jet streams that entered the galaxy echoed the X-rays, leading Pasham to believe these jet streams might be an output of the black hole’s star consumption. “The energy that’s coming out of a black hole is proportional to the energy that is going into the black hole,” Pasham said. In more crude terms, Pasham said, the black hole is essentially digesting the star. Such black hole jet streams can have large implications for the galaxies they enter. Pasham said they can regulate the growth of a galaxy because of their energy levels. Black holes are regions of space where gravity pulls so much that even light cannot get out. Pasham led the study alongside researchers at Johns Hopkins University. It was published Monday in Astrophysical Journal. Pasham said in the future, he hopes scientists can understand why some black holes seem to emit larger jet streams than others.